At The Table... With Doris Italian Market: Recipes: Going Coo Coo for Coconuts! When coconuts are accesible, here are a few recipes from specialtyfood.com to maximize your enjoyment and get true variety from this tropical staple. This trendy ingredient brings a touch of tropical flavor to your prepared foods case. Ah, coconuts! As food-loving travelers to India and Asia know well, dishes that include the hard-shelled fruit (botanically, they aren’t nuts) of the coconut palm add style and elicit thoughts of tropical settings. Where once only fresh coconuts, canned milk and sweetened shreds were readily stocked in American markets, today choices include shelled coconut meat; bottled coconut water (a new health-food darling); regular and light canned milk; sweetened or unsweetened flakes in a variety of sizes; as well coconut palm sugar, coconut syrup, extract and oil. In fact, food professionals are touting extra virgin coconut oil as one of the most healthful cooking oils. The golden brown shreds add texture and a rich flavor to simple dishes like sautéed flounder with a coconut-pecan crust. (The trick is to watch that the coating doesn’t burn.) When toasted, coconut’s taste stands up to spicy flavors, including Cajun remoulade sauce. 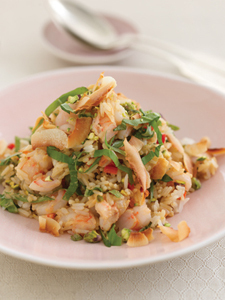 For a shrimp rice salad, layer several coconut-based ingredients, starting with cooking the rice in coconut water. Coconut palm sugar in the dressing adds a slightly caramel sweetness while coconut milk makes it creamy, and the flakes in the salad give it a crunch. Coconut desserts can be cloying and heavy, but a not-to-sweet brûlée topped with a sprinkle of toasted coconut and a thin slice of mango create a creamy, light finish to any meal. Cook the rice in this main-course salad in coconut water, rather than coconut milk, to add a subtle hint of flavor. Sweeten the dressing with coconut palm sugar, which comes from the sap and nectar of the coconut palm tree. 1. Combine coconut water, rice and ¼ cup of oil in a saucepan; bring to a boil over high heat, then cover, reduce heat and simmer for 20 minutes. Remove from heat and let stand for 10 minutes. Turn into a large strainer, rinse with cold water and drain well. Transfer to a large bowl. 2. Meanwhile, cook shrimp until just done. Set aside to cool. If jumbo shrimp, cut in three pieces and add to the rice. 3. In the jar of an electric blender, combine peanut butter, coconut milk, ¾ cup lime juice, Thai fish sauce, palm sugar, ginger, 2 ounces of red chiles and garlic; purée until smooth. With the motor running, add ¾ cup of vegetable oil and let it emulsify. 4. Add scallions, pistachios, coconut flakes, basil leaves and the remaining minced red chile pepper to the rice. Pour about two-thirds of the dressing over the salad and toss to blend. Add remaining dressing and additional lime juice, if desired. Transfer to a serving platter and add remaining pistachios, coconut flakes and basil leaves as garnishes. These sautéed fillets with a crunchy coconut-pecan mustard crust should appeal to many customers. Serve with a piquant chipotle-flavored remoulade sauce, best made about an hour ahead of time, or a tangy fresh mango salsa. 1. First make the Cajun Remoulade: Combine all of the ingredients in a bowl, stir to blend, cover and refrigerate for at least an hour before serving. 2. For the fish: Put the seasoned flour in a flat dish. In a second flat dish, combine the coconut and pecans with 2 teaspoons of salt. 3. Dip each fillet in flour, dusting off any extra. Brush one side with mustard and put it in the coconut-pecan mixture, pressing lightly to cover completely. Repeat on other side of fillet. 4. Heat oil in a large skillet over medium-high heat. Add fillet and cook until golden on each side, about 2½ to 3 minutes per side, turning once. Remove and keep warm. Crème brûlée is a wonderful medium in which to showcase coconut. 1. Preheat oven to 325 degrees F. Combine ginger and coconut rum in a small bowl and set aside. 2. In a large bowl, beat egg yolks and sugar together with a whisk until pale yellow and thick. 3. Heat coconut milk and heavy cream in a saucepan until small bubbles form on the edge of the pan. Slowly whisk a little of the heated coconut milk mixture into the egg yolks to raise temperature; then slowly whisk in the remaining milk. Stir in salt and soaked ginger. Ladle ½ cup of the mixture into 24 ramekins. 4. Put ramekins in a roasting pan, add enough water to the pan to come about halfway up the sides of the ramekins, cover with foil and bake until edges are set but centers move slightly when the cups are gently shaken, about 45 minutes. 5. Remove ramekins from the water, uncover and chill until cold. Recover and chill overnight or until needed. Garnish each cup of custard with a teaspoon of toasted coconut and a small slice of mango.